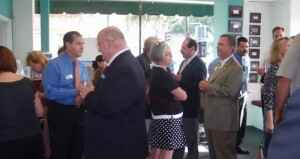 Mayor Pro Tem Jerry Amante, Councilmember Doug Davert, Tustin Chamber President Steve Scott were just a few gathered for the “Old Town Tustin Meet & Greet” reception held at the Tustin Chamber’s Board room to who they presented the 6-Month Marketing Plan for Old Town Tustin. When the original decision was made in 1991 to close MCAS Tustin, the city was faced with the loss of its most prominent feature. The local community did not oppose the base’s closure, however, instead proceeding immediately to plan for its reuse. The base was finally conveyed to the city by the Navy Department in May 2002. Since all but a small portion of the base acreage lies within the Tustin city limits, its addition will increase the City’s land size by about one-third. The City’s vision for Tustin Legacy is that of a compact and walkable, mixed-use community with a distinctive sense of place that builds on the major features of the site, and that is synergistically linked with the adjacent disposition parcels. 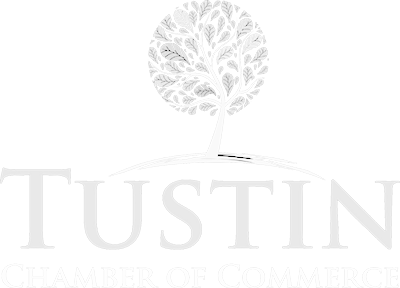 It is envisioned as a premier master planned district within the City of Tustin—a mixed-use district that enhances the quality of life for Tustin residents and that demonstrates the city’s commitment to quality development, smart growth and sustainability. The district will create a new center of activity within the city, providing an engaging place to live, work, learn and play, a place that complements and supports adjacent neighborhoods and districts, and a place that offers significant new resources to the broader region. Tustin is a city of diverse neighborhoods. From Old Town, which strongly relates to the city’s historical heritage, to Tustin Ranch, a high quality master-planned community, Tustin’s existing neighborhoods have a unique and rich character contributing to the overall identity and livability of the city. Tustin Legacy is envisioned as a new neighborhood district, one that maintains and enhances the community’s quality of life while establishing a new model for development in the twenty-first century. Tustin Legacy will provide a new activity center and “anchor” for the southernmost sector of the city, which has long been separated from the remainder of the community. Surrounded by urban development involving an array of land uses, Tustin Legacy also provides for the expansion of major office and light industrial business park uses to the south and southwest. The district will include up to 4,049 units of housing within Tustin’s jurisdiction, and over nine million square feet of commercial and institutional development. 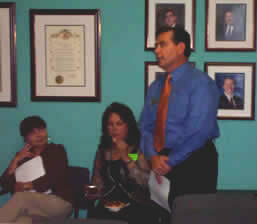 Chamber President, 2006-2007, Steve Scott informs the many interested business owners & merchants of Old Town Tustin the plan to revitalize Old Town as Executive Director Marisa Charette looks on. The centerpiece of Tustin Legacy is its Master Developer Concept. The Master Development Site is approximately 700 acres of the Tustin Legacy property. The Master Development Site may include up to 1,825 residential units at a range of densities; approximately 3.3 million square feet of mixed-use development; nearly 3.4 million square feet of R&D, industrial, and office uses; more than 500,000 square feet of retail/commercial uses; a resort hotel with between 250 and 500 rooms; and a range of open space and education uses. An 87-acre project called “The District at Tustin Legacy” is located at the northwest corner of Jamboree Road and Barranca Parkway. The one million square foot retail project will be a Class A lifestyle and power retail center with a complete set of high quality amenities intended to function as the leading retail/entertainment element within the larger Tustin Legacy project. The central lifestyle component of the project will contain over 250,000 square feet anchored by a state-of-the-art 14 screen megaplex movie theater complex with at least 3,000 stadium type seats, restaurants, bistros, cafes, entertainment and retail uses. The second component of the project will include large in-line commercial stores to be located along a portion of the Jamboree Road and Tustin Ranch Road frontages of the project site. The third component of the project is designed for more regional power uses and will be anchored by large retailers. Approximately 68 acres of land will be developed by the South Orange County Community College District for the Advanced Technology and Education Park (ATEP), a model 21st century educational environment and a direct link between students and the high tech business community driving Orange County’s economic development. When fully implemented, the ATEP campus will provide a market-sensitive and sustainable world-class learning environment for residents, workforce education and training, and will encourage County-wide public/private collaboration and innovation. Adjacent to the Community Core, an 84.5-acre Urban Regional Park to be developed by Orange County will feature recreational and cultural facilities as well as a family youth resource center and animal control facility. Retention and reuse of the northern blimp hangar may be considered as part of the Urban Regional Park as well. East of the Urban Regional Park, an approximate 40-acre high school will also be developed by the Tustin Unified School District.